I noticed our local cinema is showing The Last Station which is about the last year of Leo Tolstoy’s life. Tolstoy is played by Christopher Plummer and his wife is played by Helen Mirren. The names of these two actors got me thinkng about philosophers portrayed in movies: Plummer, of course, played Aristotle in the film Alexander, and Mirren played Ayn Rand in The Passion of Ayn Rand. But I must admit I’m struggling to come up with many philosophers who have featured on the big screen. There is Derek Jarman’s Wittgenstein of course, and Nietzsche has made an appearance in a coupe of obscure movies such as When Nietzsche Wept and Liliana Cavani’s Beyond Good and Evil. I recall one director recently stating that he would like to make a movie about Socrates, but it actually surprises me that there isn’t one already (or is there?). Given how colourful the lives of philosophers can be (with the notable exception of Kant: that would be a very dull movie indeed!) I’m surprised I’m struggling to recall many films of them. Also, who would make the best philosopher to make a film of, and who would have the starrring role? Brad Pitt as a hunky Socrates (well, you had Keanu Reeves as that Buddha dude), or Ricky Tomlinson as Zizek? I think a film on Descartes would be interesting (played by Johnny Depp) a strange philosopher played by the VERY strange actor. Tony Steedman does a good Socrates in Bill and Ted's Excellent Adventure.. I'm having trouble opening those links! Descartes, yes, and Johnny Depp can play anyone weird. I also think Sarte would be good material for a film, although he admitted himself he was ugly so Hollywood may struggle to find someone to fit the bill. Maybe a movie about Sartre and Simone de Beauvoir? Maybe Simone Weil, philosopher and political activist? We have had Iris Murdoch, but I suppose, that was more to do with her illness. Bertrand Russell led an interesting life? Helena Bonham Carter for either Simone? Albert Finney or Kevin Spacey for Sartre? Anthony Quinn (but maybe he is too old or even dead now) bears a striking resemblance to Albert Camus. The question is who would play the University of Gloucestershire's esteemed philosophers Dave, Roy, Will and Emily? Ha! Turning it inside out, Roland Barthes appeared as Thackeray in a film version of the lives of the Brontes, and Cornel West is in a couple of the Matrixes (matrices?) – are these the only example of world-famous thinkers actually acting in movies? Definitely – sometimes it was difficult to distinguish between Gervais and Large. I'd like to see a movie about Spinoza and Leibniz. But who would play them? I think Godzilla would be perfect for Spinoza, and King Kong perfect for Leibniz. Ian McKellen as Bertrand Russell. Jon Voight as Donald Davidson. Helen Mirren as Martha Nussbaum. I contest your suggestion that a film about Kant would be terrible. I appreciate that Kant's life and personality is commonly seen as boring. But for me, Kant is an inspiring philosopher and fills me with such passion. i feel almost like you are posing a challenge to put out a good Kant movie out there (perhaps I'm tmepted to consider it). For me, Kant represents an aggressive system destroyer. Imagine the stories of Kant walking down the streets of Konigsberg, and visualising another mental world where his thoughts are led to issues as diverse as the scientific status of phlogiston theory; the moral significance of poetry; or the powerful notion that the categories structure experience insofar as we can have any experience at all. If we allow such anachronisms. Maybe the story of Kant will jump forward to the future to see how influential he was; Hegel, Marx, PF Strawson, Godel, Hilbert and Poincare. If a film about a great figure is immediately judged as bad before its even made because the protagonist was a virgin who didn't sleep late; then one may either tweak the details (a la 'When Nietzsche Wept') or explore the ideas of his philosophy through the media of film (a la Jarman..which is a much more interesting project). Clearly Peter Falk (a la Columbo) as Socrates. (“I just have one little question I'd like to ask…”) – perhaps in the Protagoras, a dialogue with much comic potential? Stephen Hawking appears as himself in a Star Trek The next generation episode…not a philosopher, but close enough. Bertrand Russell appeared as a significant minor character in Tom and Viv, a film about T.S. Eliot and his wife. Gladiator features Marcus Aurelius, although I doubt (I haven't seen it) that it reflects much of the Meditations. Peter Falk as Derrida, definately Steve Buscemi as Sartre. Loving the idea of Detective Inspector Derrida.. There have been films made, very good ones I might add, about both Descartes and Blaise Pascal. Sir Ben Kingsly played Gandhi in 1982. Armin Mueller-Stahl as Martin Heidegger. Tom Cruise could play Rousseau, and John Goodman as Hume. Alain Badiou is apparently writing a script about Plato and would like Brad Pitt to play both Plato and Socrates. I don't know how that is real but it is. Re the post on Philos-L concerning films where philosophers of either good or ill repute appear as themselves. A few spring to mind: (i)Derrida appears in a film documentary of the same name (2002),(ii)Robert C Solomon appears (admittedly 'rotoscoped')in 'Waking Life'(2002). An absolutely platonic film: Il conformista, Bertolucci. And so on, there are a lot. By the way, I can't imagine Pitt in Socrates. Socrates, Plato wrote, looked like a old and ugly satyr! The characters of Lost resemble many philosophers and scientists which I think is a good thing. Some characters have been directly named as philosophers such 'Desmund' David Hume, Jeremy Bentham. Where others have been linked to philosophers such as Rousseau, Burke and the ones you mention. Dostoevsky, Nietzsche and Plato have also been mentioned in episodes. Also an episode in the first season was called 'Tabula Rusa' in which the philosophical notion was presented. Tom Frederic played Wittgenstein in /The Oxford Murders/ (http://www.imdb.com/title/tt0488604/fullcredits) in a very minor role. A movie about Wittgenstein would be fascinating–at least to a philosophical audience; perhaps also to the general public. I nominate John de Lancie for the role (the guy who was Q in Star Trek). Locke's life was interesting. And a lot of people have heard of Locke. Hume's life would also be interesting simply because he was the formidable agnostic (falsely known to many of his time, I believe, as an atheist) philosopher of his era. John Stuart Mill's life would perhaps be the most film-worthy of all. The reform that he and his colleagues worked to inaugurate was important and intersects nicely with his philosophical views (although I'm not sure I would want to convert a general audience to utilitarianism). It would also be easy to incorporate other important figures: James Mill, Jeremy Bentham, and of course Harriet Taylor (Mill)–complete with a love triangle! Apparently he was also the godfather of Bertrand Russell. Sorry these suggestions are so Anglo-centric. Okay, to compensate, I'm sure movies about Socrates, Plato, and/or Aristotle, or Confucius, would draw crowds. Holly Hunter could certainly capture the look and mannerisms of Martha Nussbaum. Kurt Godel was a character in a pretty terrible romantic comedy starring Walter Matthau as Einstein and Meg Ryan as his niece. Has anyone seen the philosophers' soccer match (Monty Python)? 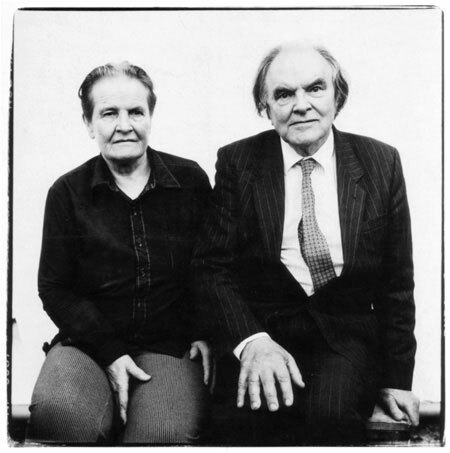 This image of Anscombe and Geach is used a few times in the movie Closer. I think St Augustine would be an interesting character for a movie. There are two films of Socrates (beyond Bill & Ted): one an Italian TV movie by Rossellini called Socrate (I have it on DVD) and another starring Peter Ustinov called Barefoot in Athens, which I haven't been able to locate. Aristotle appears in both the Alexander movies (old and new); Cicero appears in Cleopatra, as well as the BBC series Rome, Seneca appears in Quo Vadis, and Marcus Aurelius is in both Gladiator and Fall of the Roman Empire. I haven't read all the comments so someone may have already noted that there is a long feature film about Jean Jacques Rousseau which also features a substantial depiction of David Hume. Also, Liliani Cavani wrote a scenario for a film about Simone Weil that never got made. I think that Walter Benjamin would make a good subject for a film.